New scratch-made textures for the roadsigns in 4K and 2K. Removed all obvious seams. The one on the main pole is now gone! 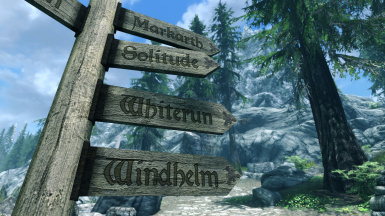 Added option in the installer to textures with the vanilla font. Centered all text and nails on the signs. 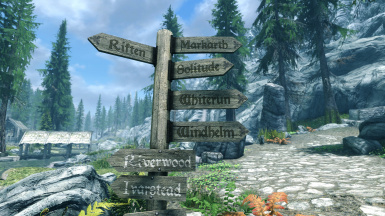 This is a scratchmade retexture of all the roadsigns in Skyrim. They have been remade to be more easily read and look less flat and old. They are available in 4K and 2K. All screenshots were taken with the 4K version. 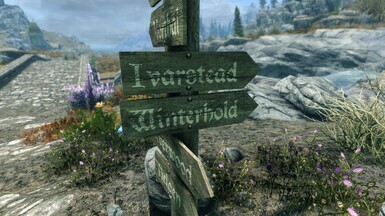 The goal of this mod is to provide roadsigns that are much more easy to read and less blurry. 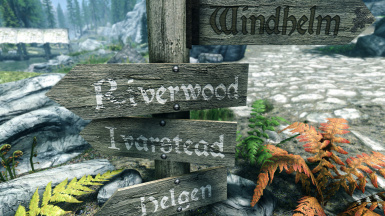 I do realise that having signs that are out in the wild in the old days would have resulted in them being covered by all sorts of crap, but I decided to turn a small blind eye to those details and rather focus on making the signs look aesthetically pleasing. Recommended to install using Vortex (or NMM) and use the fomod installer. Follow these steps if you want to do a manual install. Navigate to Payload\main\**sizeyouwant**\ and copy the texture folder to the data folder. Be sure to also drag the contents of the Mesh folder in the main folder to the data folder.You have now installed the main mod without any patches. Navigate to Payload\patches\CuttingRoomFloor\ and copy the two folders to the data folder. You have now installed the patch for Cutting Room Floor. Navigate to Payload\patches\PointTheWay\ and copy the two folders to the data folder. You have now installed the patch for Point The Way. Navigate to Payload\patches\WhistlingMine\ and copy the two folders to the data folder. You have now installed the patch for Whistling Mine. 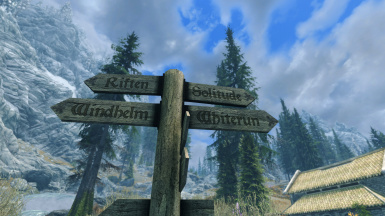 This mod WILL conflict with any mod that alters the textures or meshes of the roadsigns. 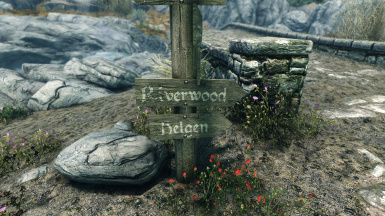 This mod adds new textures to the signs from these mods. This mod was entirely made by me using Substance Designer, Adobe Photoshop CC 2017, Quixel Suite 2 and Intel texture Plugin. I do not permit this mod to be uploaded to any other site other the the Nexus. If you want to upload it elsewere, ask for permission. I usually say yes if you ask.